Survival is a matter of resilience, growth and movement. If the first human beings didn’t have gens that make them adaptable to the changes of their environment, we wouldn’t be here. If the first tribes of human beings didn’t have the aim of growing as a society, we wouldn’t be here. If some members of those tribes didn’t have the gene DRD4-7R, we wouldn’t be here. Travelers have always played a crucial role in the survival of humanity. Yes, traveler that you are reading this: You have information inside every cell of your body stored in a way that quantum physics laws allow to replicate and generate that electrical push in your head that whispers “Travel, travel travel, …”. By traveling, first human beings were able to take profit of resources of different places and environments and stablish new settlements. Without traveling, the growth of humanity was not possible, therefore we would have ended living in a single settlement with limited resources and just having a constant number of members in our tribe… or dissapeared. Death would have played a major role in our society… wait, mmmm… isn’t it what we already have? Yes! Religion canalized the reality of death in societies that stayed too much time living in an environment of limited resources. Only when abundance is everywhere religion starts loosing one of its feeders. But at some point, there was enough for living in almost every corner of the planet. Globalization and oil abundance made possible to have goods from the furthest place on Earth and traveling for survival is something that many people in the western world didn’t need to experience. These DRD4-7R carriers, as Laura and me, are very fortunate. If you have everything you need next to your home and you still can fulfill the need of “Travel, travel, travel, …” you are one of the most fortunate in the world. There are DRD4-7R carriers that cannot travel. And there are no DRD4-7R carriers that need to travel to survive. Those people suffer a lot because they are playing with the last card of their survival: traveling. Abundance created the perfect scenery for DRD4-7R carriers: an entire planet to discover during a human life. Planet Earth is our game board while for some people traveling is still the only way to survive. But planet Earth is limited. 510.072.000 km2 is the total area of the planet. 148.940.000 km2 is the total land surface. At some point we won’t be able to travel further for survival, there won’t be enough oil to sustain globalization and there won’t be enough resources to mantain a constant growth of humanity. Traveler, be prepared. Maybe not you, but your children or the children of your children or the children of the children of your children will need to leave the Earth. They will have the DRD4-7R gen and they will need to fulfill their “Travel, travel, travel…” in a different way that we do. They will be the pioneers. They have already been selected by nature. I do love traveling but I don’t feel like I always have to be traveling. Some down time is good too. I also look forward to the day when I have seen everything, right now my list is so long. #TheWeeklyPostcard. I know that feeling of having a rest after a travel. It is good to come back home after a travel. But somehow after some time at home I start looking for my next destination. It is crazy 😅 Thanks for your comment! Oh I am infected bad by the travel bug! 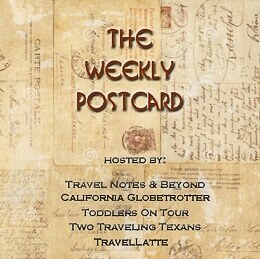 Perhaps I have generations of history of family that traveled culminating in me having an unhealthy obsession with travel haha Thanks for linking up with #TheWeeklyPostcard! Unhealthy obsession! Haha I liked it 😂 Thanks for your comment!